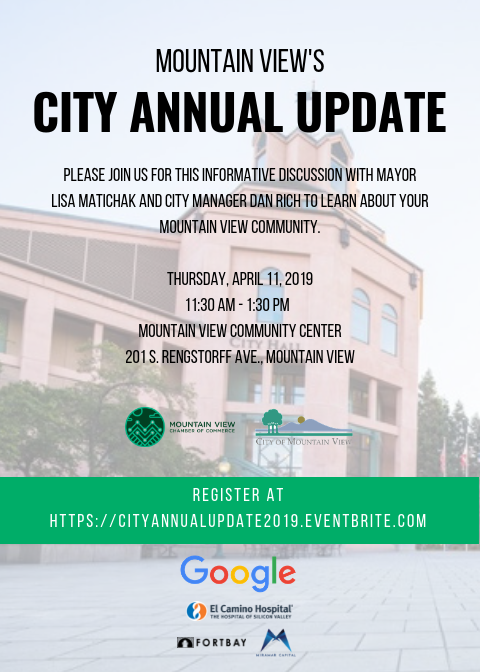 The Mountain View Chamber of Commerce would be honored to have your business sponsor the City Annual Luncheon. Below is the list of sponsorship marketing benefits as well as the sponsor contribution amounts. Your company’s name and/or logo identification on all advertisements and press releases. Your company listed as Presenting Sponsor in the Official "City Annual Update" program. Logo on Chamber's Website - Home Page & Event Page. Sponsor signage displayed at event. Recognition from the podium during the program. 8 tickets to the event or hosted table. Your company’s name and/or logo identification on various advertisements and press releases. Your company listed as Sponsor in the Official "City Annual Update" Program. Logo on Chamber's Website - Event Page. Contact Dawn Maher for more information.